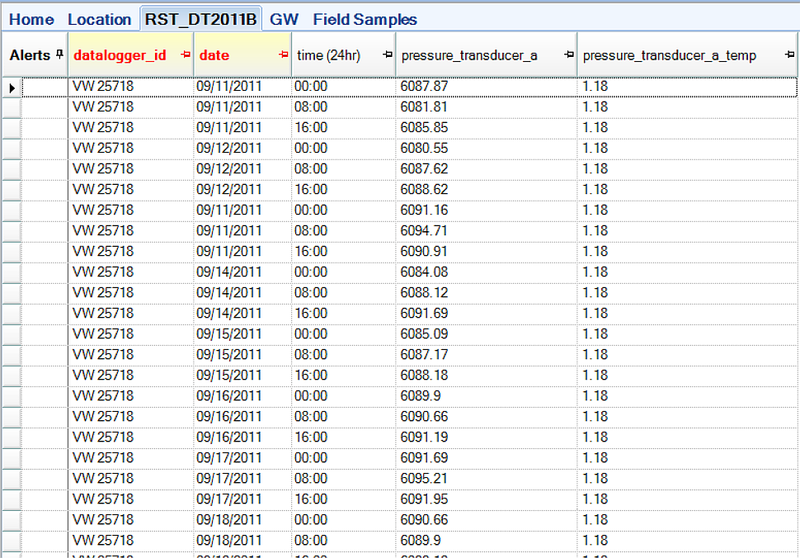 EDGE will import the raw *.csv file that is produced from a RST data logger. The following list shows what headers are supported with the import (the header name must start with the text shown). The headers can be in any order for the import to work, but 'data logger id' and 'Date and Time' values must be present for each line of data. The 'Data and Time' column must be in the type of 'Dublin Julian Date'. 3.Click Open File to select and open the csv file. The data will now load into the RST_DT2011B tab within EDGE. This data will be saved in the EDD that is exported from EDGE, and is ready to import into EQuIS. To import the data into the Live Schema, the required records listed below must already have been created. 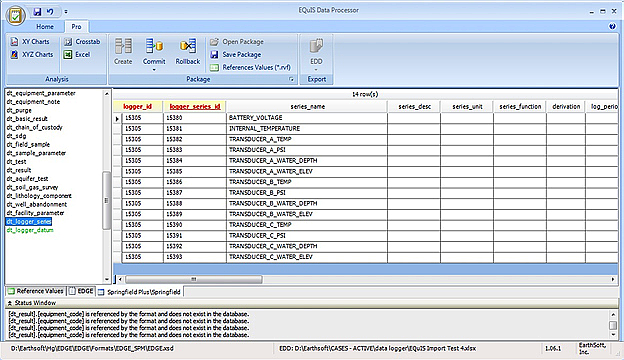 •A DT_LOGGER record that matches the data logger id of the data being loaded. For the water series to be created this record must have the SYS_LOC_CODE value. •A DT_LOGGER_SERIES record for each transducer using the series name TRANSDUCER_A, TRANSDUCER_B, TRANSDUCER_C, TRANSDUCER_D. •TOP - For the water series to be created a DT_MEASURE_DATUM record must be present for the location (SYS_LOC_CODE) that is associated with the DT_LOGGER_SERIES record. It will use the most recent record as the collar elevation. After the first set of data has been created, EDP will create new DT_LOGGER_SERIES for TRANSDUCER_A_WATER_DEPTH and TRANSDUCE_A_WATER_ELEV. The SERIES_UNIT for each of these new records should be completed either in EDP or in EQuIS Professional data tables.